After some considerable effort I have obtained a photocopy of what was no doubt a very impressive Hartlepool Tall Ships Bid Brochure. It is long on generalities, artists impressions and hype but very short on specifics. There were many things that made interesting reading, including the fact that 175,000 visitors created a party mood through out the entire town when the ships came for a visit in 2005. I must have been busy that day! Also, no mention of how this number was arrived at? 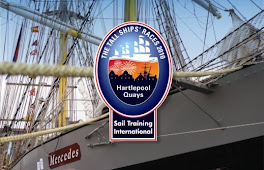 Most worrying for me was that throughout the document there were numerous mentions of what Hartlepool would do for the crews and race organisers. We will pay for race paraphernalia, provide trophies, handbooks for captains and crews, chauffer driven fleet of cars, free meals in the restaurants in the Marina Area, free hotel accommodation for race organisers, crew party, captains dinner, ships officers party, full day sightseeing tours for crews to Durham, Beamish, Hadrian's Wall, Alnwick Castle, etc, free admission to historic quay, Mill House Pool, 10 Pin Bowling, Brewery tours, Golf and Mecca Bingo. Hartlepool will pay for all insurance and port fees. "Hartlepool understands that a significant budget will be required to cover the costs of the visit by the Tall Ships' Race. This is why we have involved all economically relevant stakeholders in our bid to STI. We are confident that the required level of funding will be available to host the event and are happy to met with the committee to explain how the finances will be raised through our partners and other sponsors. We confirm that all invoices will be paid by Hartlepool within 30 days"
My enquiries at Cabinet level have revealed that they are just as much in the dark as everyone else. Only the Mayor (and one assumes his chosen band of Officers) must be in the know as to exactly “how the finances will be raised through our partners and other sponsors"
No briefing has been offered to back bench Councillors but then that’s not exactly surprising.